Chris Connelly is the founder of Contrarian Investment, an investment strategy in the form of sports betting on select NFL, NCAAF, NBA, and NCAAB contests. This is a new category of investment that wasn’t available to people before – ever in history. On this episode, Chris shows why sports betting is the next big thing and foresees it to become a trillion-dollar industry. He explains how sports betting works and why it should not be considered a gamble, but an investment instead. 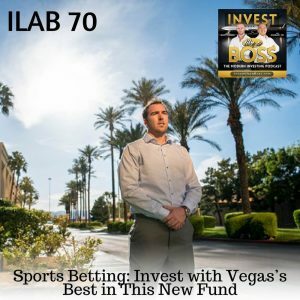 Listen to the end to find out how to invest alongside Vegas’s best and see how your investments play out. Listen to ILAB 70 on iTunes here or subscribe on your favorite podcast app. 7:33 – How he got into Sports Betting? 10:44 – How does a syndicate operate? 12:04 – What is a Bookie? 27:26 – How much do they bet in a time frame? 29:57 – What sports do they usually bet on? 36:33 – Who are the investors?